You'll likely spend months planning the perfect wedding day — but it's often the unscripted parts of the day that become the most memorable. These silly moments captured on camera are guaranteed to put a smile on your face. This couple created a fun optical illusion by having the bride sit on the groom's shoulders. A super-buff bride, or another creative optical illusion? No, those aren't their middle fingers! This groom's reaction upon seeing his bride for the first time is priceless. Take a simple kissing photo to the next level by flipping the groom upside down. Channel Spiderman for a daring photo. Float into your wedding like Mary Poppins. Hurry, we're late for the party! Jump for joy — it's your wedding day! This groom is literally head over heels in love with his bride. Fore! This photo was the perfect match for this couple's wedding on a golf course. These dolphins are the cutest photobombers ever! Are you ready for some football? This couple made a memorable entrance to their wedding reception. The couple showed off their balancing skills. Celebrate your newlywed bliss by jumping on the bed in your hotel room. 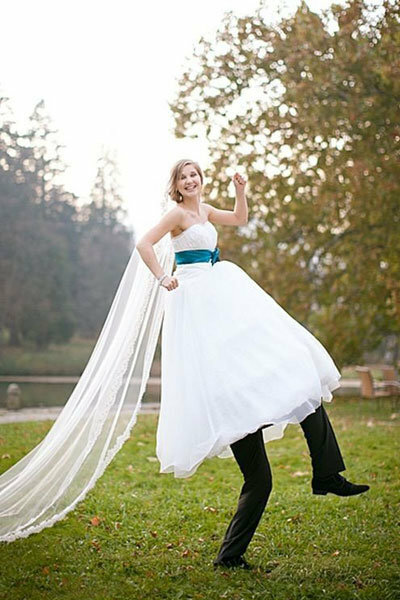 This probably isn't what the photographer had in mind when she told the groom to lift the bride. The groom, just hanging with the girls! Arm your bridesmaids with maracas for a fun and festive destination wedding photo. Heave ho! This man is going overboard. The bride tried her best to shield her innocent flower girl from the bridesmaids' shenanigans. Related: Biggest Bridesmaid Dilemmas: Solved! A jumping photo is even more fun when you strike a pose mid air. These groomsmen had a blast frolicking with their umbrellas. A pointed fence made the perfect spot to reenact the infamous Titanic pose. Use your phones to capture a selfie of each of your groomsmen. How much do you trust your groomsmen? This groom got a little help from his friends to crowdsurf over to his bride. Grooms love showing off their new bling, too. This couple cast a spell on their bridesmaids and groomsmen, Harry Potter-style. This Jurassic Park-inspired photo went viral and spurred dozens of copycats, but nothing can top the original! Play ball! This couple took a time out from the wedding festivities for a quick game. We love the look on the bride's face in this daring photo. This groom couldn't resist taking a peek at his bride before the ceremony — with a little help from his friends. This ring bearer isn't afraid to tell the truth. This flower girl couldn't contain her excitement during the couple's first kiss as husband and wife. These flower girls' reactions during the couple's kiss are just priceless. High five, it's your wedding day! Dad carried the bouquet in style. Avert your eyes from the PDA! Have you ever seen anymore more excited to catch the bouquet? These pranksters had a little fun during the garter removal. This groom was in for a real surprise when the bride switched places with her dad before the garter removal! These chairs are guaranteed to lead to some hilarious photos.